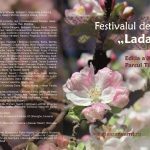 Launched in 2006, “The Hope Chest” Art Festival gathers at Piatra Neamţ dozens of craftsmen from several parts of the Romania and from the Republic of Moldova. This year, the festival reached its 13th edition. 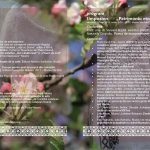 Those who love traditional crafts and folk art and, widely speaking, all lovers of aesthetics are expected this weekend to visit the area of Youth Park in Piatra Neamţ in order to whitness a spectacular visual, olfactory and gustatory show. Here, visitors will be able to admire and buy traditional products from a large variety of fields: ceramics, wood and furniture, domestic industry, soft goods and traditional costumes, leather works, glazed eggs, icons and naive painting, braids, folk masks, ornaments, traditional foods, bone objects, glassware, and even musical instruments and toys. 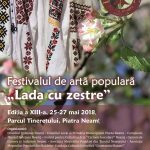 This year’s festival centers around the theme of the “Romanian Ethnographic Patrimony“, bringing together more than 80 craftsmen who, through their creativity and craftsmanship, will recreate the atmosphere of the traditional Romanian village right in the center of the city, in the Youth Park. The official opening will be on Friday, the 25th of May, around 12 A.M. 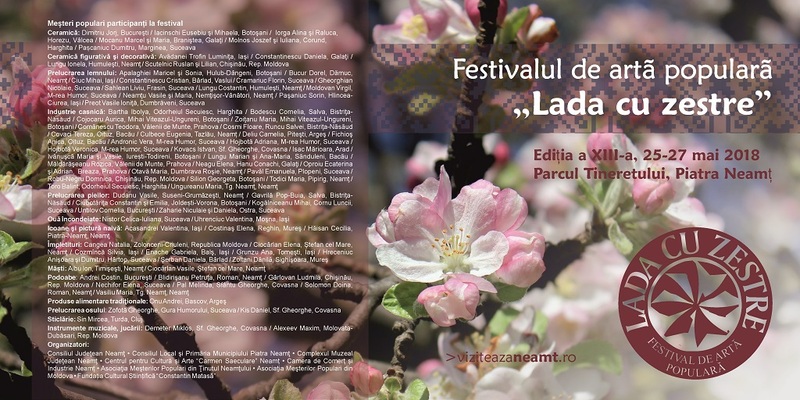 The opening will be followed by artistic programmes presented by the Artistic Ensembles “Dor vânătorean” and “Edelweiss”, both assemblies under the supervision of “Carmen Saeculare” Centre for Culture and Arts of Neamt County. 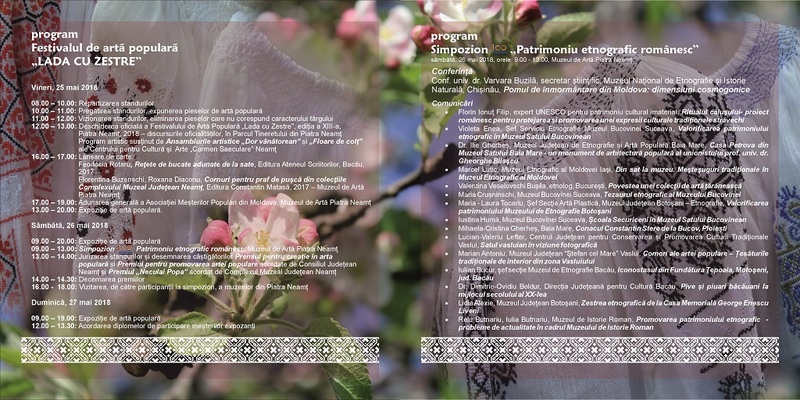 On Friday, between 4:00 and 5:00 P.M. participants could take part at the official launching of two volumes, dedicated to promoting the traditional arts, customs and food: “Recipes Gathered from Villages” written by Feodosia Rotaru and “Powder horns from the Collections of Neamţ County Museum Complex”, written by Florentina Buzenschi and Roxana Diaconu. On Saturday, the 26th of May 2018, inside the square of the popular art exhibition, the judging of the stands and the nomination of the winners of 2018’s edition will take place. 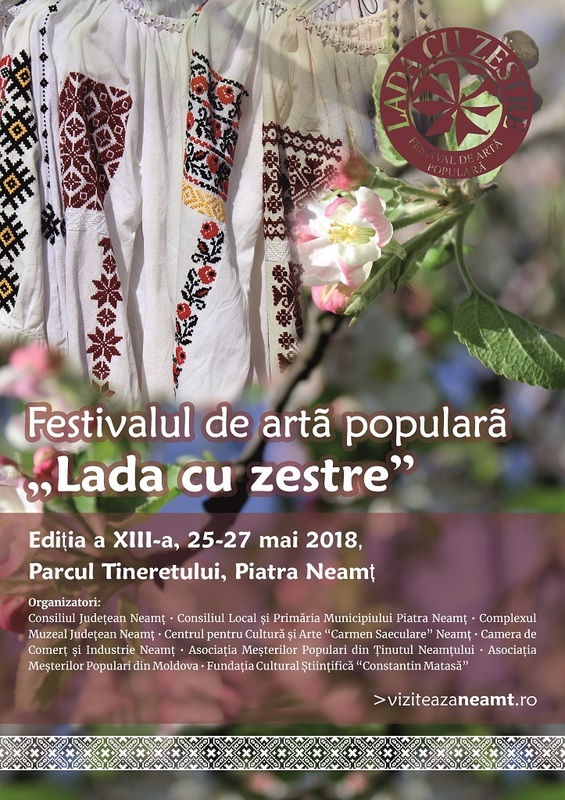 Three prizes will be awarded: Prize for Creativity in Folk Art, Prize for the Promotion of Folk Art (granted by the Neamt County Council) and “Neculai Popa” Special Prize (granted by Neamţ County Museum Complex). The last day of the festival will be Sunday, the 27th of May, during which visitors will still be able to enjoy the traditional art exhibition (till 7 P.M.). Between 12 A.M. and 1 P.M, the diplomas of participation will be awarded to all the exhibitors of this year’s edition. Above others, an important place of the 2018 edition of the festival is the traditional Romanian shirt “IE”, a continuous reason for fascination to foreigners discovering the Romanian customs and traditions. The annual organization of “The Hope Chest” Art Festival aims at reviving the old crafts and the Romanian folk art, as well as continuing these crafts and passing them from generation to generation. 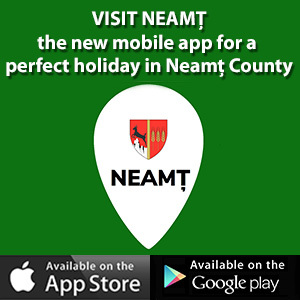 As every year, the organizers of the festival – Neamţ County Council, The Local Council and Piatra Neamţ City Hall of and also Neamţ County Museum Complex – invite you to visit the “traditional village” in the center of the city during the three days of the festival and enjoy everything which is authentic in Romanian folk art.